Join Caitlin Reilly is conversation with Andrew McDonald (Lone Goat Gallery) at 2pm on Saturday 28 October at Lone Goat Gallery as they discuss Caitlin's art practise, with a particular focus on her extensive experience working in Shanghai, collaborative workshops, art therapy programs, and strategies for emerging artists. Caitlin’s exhibition Hymn to the Horizon is now showing at Lone Goat Gallery until November 8. Hymn to the Horizon is a series of works rendered in oil paint, bitumen, dust and debris. Investigating abstract means and the simplicity of the horizontal line to explore surface rendering to access and communicate psychological states connected to lived and imagined terrains. Her works have been exhibited at the Shanghai Museum of Art, the Xuhui Art Museum, the 1933 Historical Slaughterhouse in Shanghai, Asia Contemporary Art Hong Kong 2014/15/16, Singapore Art Fair, and 'Faces & Traces' retrospective at The Swatch Art Peace Hotel in Shanghai, Taikang Community Gallery Songjiang, China. In 2014-15 Caitlin undertook the Shokay Residency, travelling to Qinghai on the Tibetan plateau and to Chongming Island nearby Shanghai, working with the yak herding community, spinners and knitters. Caitlin’s arts practice involves working in a broad range of media creating layering and textural history, with an extensive body of work exploring the development of surface rendering. Caitlin's visual arts practice spans international platforms and is represented in collections throughout Australia, Europe, America, and China. Caitlin’s exhibition Hymn to the Horizon is showing at Lone Goat Gallery Byron Bay until November 8 2017. 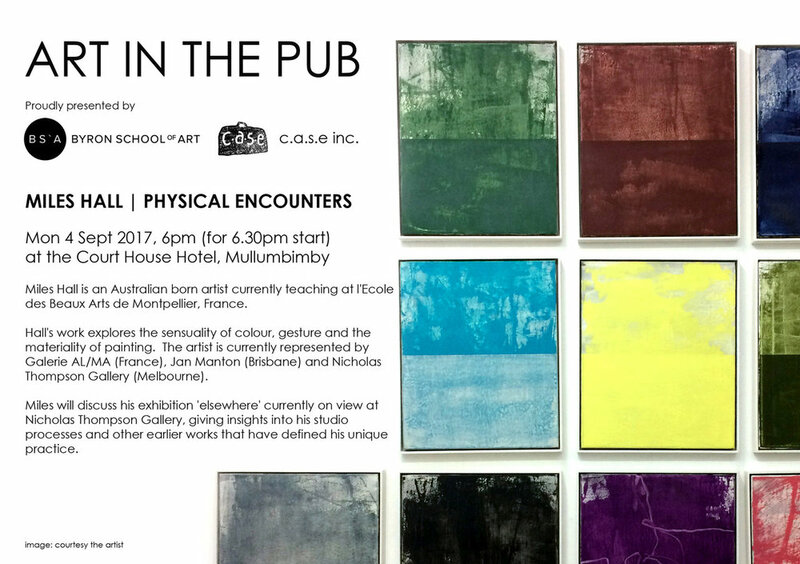 In Art, Talks Tags Art in the Pub, Mullumbimby, Mullumbimby art, Mullumbimby artist, Mullumbimby artists, Niomi Sands, Byron, byron, byron artist, byron arts, Byron artists, Byron artist, Byron art, byron artists, Byron art classes, byron art, byron art workshops, Byron arts, byron art classes, Byron Bay artists, byron bay, Byron Bay arts, Byron bay arts, Byron bay art, Byron bay artists, Byron bay, byron bay art, Byron Bay, Byron Bay artist, Byron Bay art, byron bay artist, byron bay arts, Byron Bay Art, Byron Bay Artist, byron bay artists, Byron School of Art, c.a.s.e. The wildly popular Art in the Pub series will host artist Miles Hall on September 4. The event is free but we recommend arriving early, as it is usually packed. Get a greater insight to the innovations and motivations of David Hockney, the subject of Tweed Regional Gallery's first international touring exhibition, when the Gallery hosts an Up Late event this Saturday. The UK artist's Australian-based brother, John Hockey, will join Tweed Regional Gallery Director Susi Muddiman and Blue Mountains Cultural Centre Director Paul Brinkman for a conversation from 6.30pm. The panel conversation will reflect on David Hockney's career, his exploration of digital technologies and concurrent exhibitions of Hockney's work in London and Melbourne. Up Late will be held from 5-8pm, as part of a series of events on Saturday to accompany the current exhibition David Hockney: Words & Pictures. A free talk by John Hockney in the afternoon has booked out. The Gallery cafe will be open for the evening. Drop in for wine and tapas from 5.30-6.30pm or stay for supper from 7.30-9pm. Bookings are essential by phoning (02) 6672 5088). David Hockey has been described as "arguably Britain's greatest living painter" and in 2011 was voted by his peers as the most influential British artist of all time. Drawn from the British Council's collection and direct from London, David Hockney: Words & Pictures presents four major suites of the artist's prints, produced between 1961 and 1977. United by their reference to historical works of literature and art, the prints were produced during the first two decades of Hockney's career when he established himself as a pioneer of the British Pop art movement. Collectively they offer insight to Hockney's beginnings and evolution as an artist. David Hockney: Words & Pictures will end at Tweed Regional Gallery on Sunday 17 September, before moving on for a limited time to the Blue Mountains Cultural Centre in Katoomba. 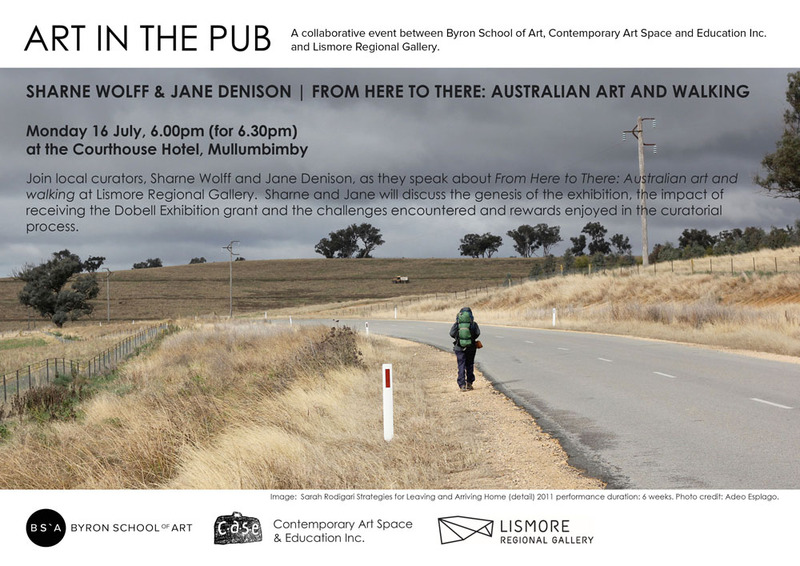 This exhibition appears at Tweed Regional Gallery with the generous support of the Tweed Regional Gallery Foundation Ltd.
For more information, visit artgallery.tweed.nsw.gov.au or phone (02) 6670 2790.